This time he’s done it ! Jeremy has finished the devirtualisation programme which will bring Aélita to life. They can all be together at long last and put an end to the super-computer! It goes without saying that nothing goes according to plan. When everyone is at the factory ready to start « operation devirtualisation », Jeremy realises that he has left the CD with the programme on it in his room. He must go back to the school to get it. That’s when he comes face to face with Jim who is determined to find out what our friends are up to. When Jeremy tries to run away from the gym teacher, he falls and sprains his ankle. 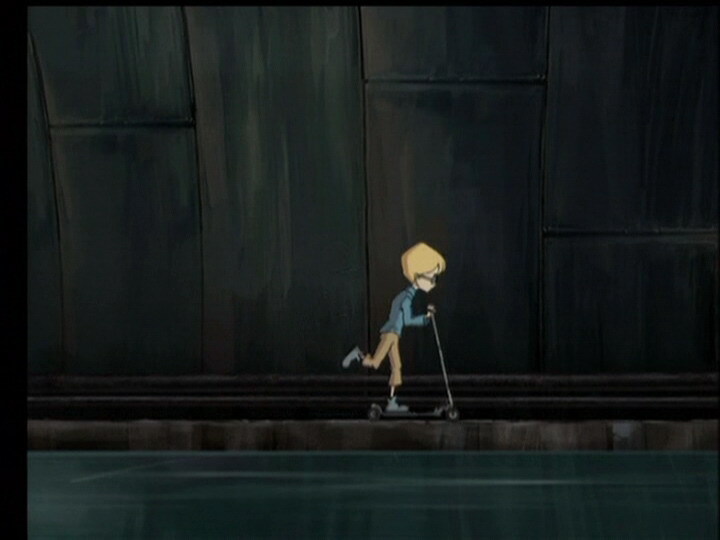 No longer able to walk, he must still somehow find his way back to the factory to start the programme and he has to do it fast, too, because Aelita is in trouble on Lyokô. Jeremy thinks he may have a solution : he will ask Jim for help. Jim agrees, but on one condition. Finally, Jeremy manages to get back to the lab and launch the devirtualisation programme. A few seconds later, Aélita is standing there in flesh and bone. Jeremy, visibly moved, whispers a few words in her ear : « Welcome to Earth… ». The group is excited: the materialisation program is operational after many long moths of work by Jeremy and Aelita! The heroes rush to the factory, followed by Jim who loses their scent when they climb into the manhole. 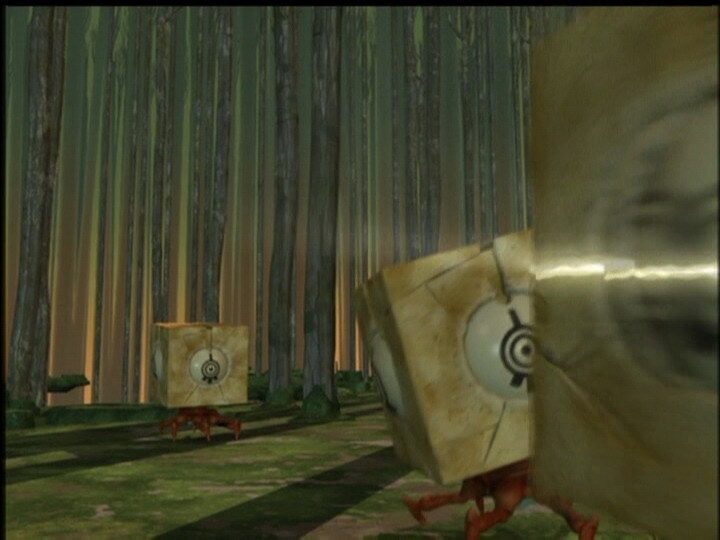 The fighters are sent to Lyoko and hide, watching the Bloks and awaiting instructions. Jeremy then realises that he’d grabbed the wrong CD and taken one of Odd’s stupid music videos instead: Break break break dance… He asks them to clear the passage while he hurries to the school to get the right CD. In doing so, he’s noticed by Jim who follows the boy slyly. Jeremy grabs the CD but runs into the teacher who demands to know why he’s skipping class… Having no credible reason to win Jim over, the brainiac runs for it, the CD in his pocket and Jim at his heels… Unfortunately, while he’s running down the stairs, he slips, rolls down the stairs and crashes at the bottom, unable to get up. Hearing the screams of pain, Jim turns pale. 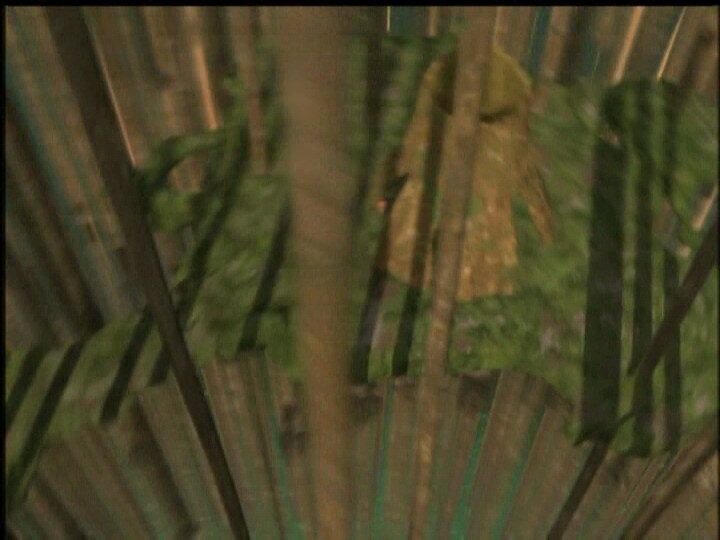 At the same time, the three friends finish up with the Bloks and Aelita enters the tower. Arriving at the lab, he inserts the materialisation CD. Meanwhile a Megatank appears in the area the tower’s in and starts to attack it, to make it unable to be used in the materialisation program… The monster is very cautious, closing its shell to take as little damage as possible from the heroes… It devirtualises Odd and Yumi with its powerful laser before being destroyed… Ulrich is left alone… He fights ferociously to save the tower, a little damaged but still useful, and Jeremy is ready… Ulrich is devirtualised. 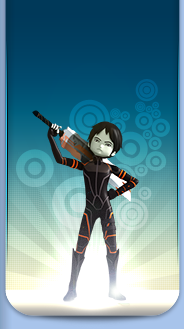 Aelita stands in the centre of the platform and Jeremy announces in a solemn tone: Code…EARTH! Everyone in the room waits impatiently in the scanner room, awaiting the verdict… The cabin opens and we can make out a young girl with very characteristic pink hair in a foetal position, apparently asleep… Jeremy admires her. She opens her eyes and smiles… The brainiac looks excited and whispers a shy phrase: “Welcome to Earth”. - Jeremy now has full control over materialising Aelita. He can do it from a tower. 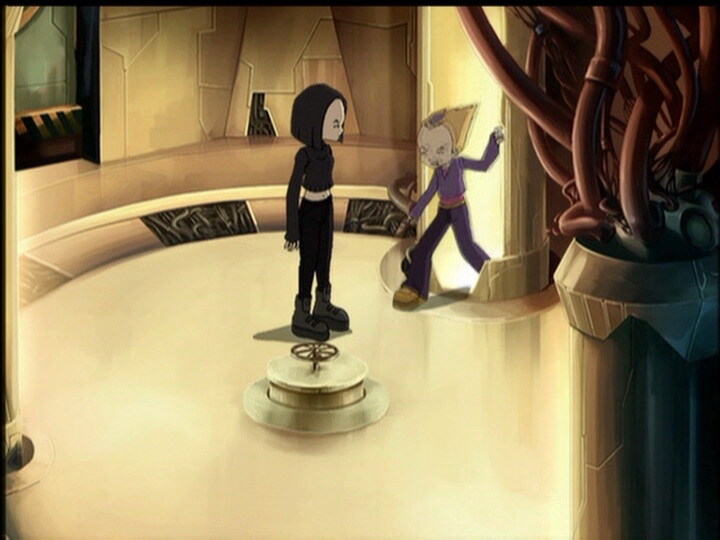 - First materialisation of Aelita, and the first appearance of her in 2D. - First time Ulrich blocks a shot from a Megatank with his sabre. - Second time Jim discovers the factory. - First time Yumi enters a tower. - Mr Ishiyama eats Japanese noodles for breakfast. - The principal is annoyed by Jim’s paranoid behaviour. - The colours of Odd’s pants are inversed during his transfer. - The deck of Odd’s skateboard is red during one shot in the sewers. - Yumi’s outfit is reversed when she throws her fan. - The computer microphone appears during one scene when he hadn’t put it on. - The marks under Nicolas’ eyes disappear when he leaves class. - Yumi’s black pants and shoes appear when she answers the phone. - The principal’s eyebrows are grey when he tells Jim “I warned you” and that he’s sorry to fire him. 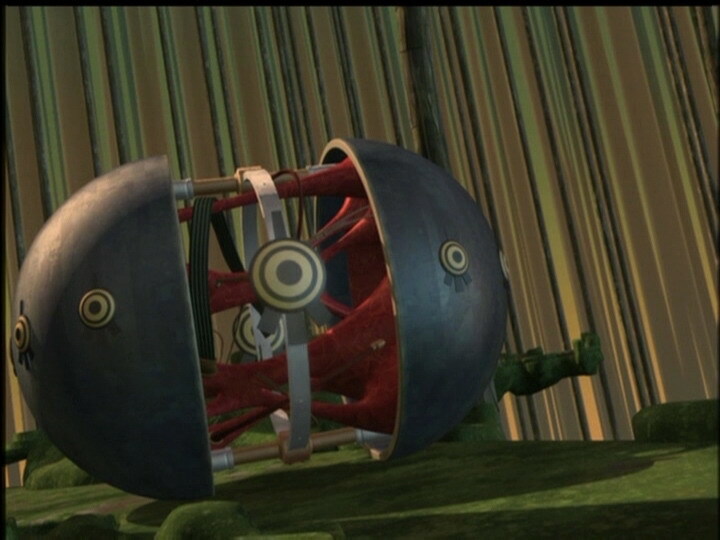 - Note that the tower Aelita is materialised in has a red halo during certain scenes but it’s not activated! - Just before Jeremy enters the lift, we notice his school bag though he didn’t take one to the factory. - During Ms Hertz’ class, we note the presences of Emilio Rodriguez and Mohamed Kantaoui of year 7 and Sandra Dialo of year 6. - When Jim sees the heroes leave the science building and he hides behind trees in the park, his band-aid is on the wrong cheek. - The factory microphone is in Jeremy’s right ear before he tells Aelita he’s launching the materialisation program and it disappears before he says “Scanner Yumi”. - The doors to the student dorm rooms are dark green when Jeremy begins to run, they’re grey when Jim pursues and they’re grey when he gets stuck. - Emilie, Heidi and Magali are in Yumi’s class when they’re meant to be in year 8. When Odd leaves class, we see Emilie in the hallway, she can’t be in two places at once. 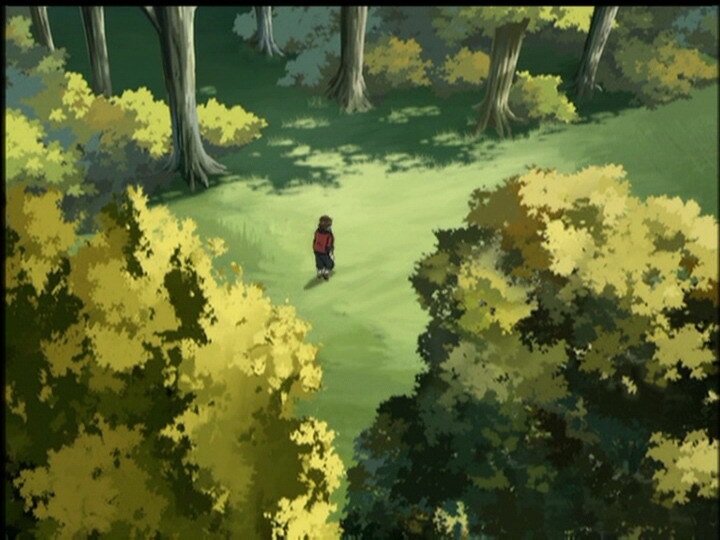 - Only episode written by the writing director Sophie Decroisette for season 1. - First of two episodes in the season 1 finale. - First use and mention of Code Earth. - Jeremy’s flashback is from episode 19, “Frontier”. - The access code on the lift for the lab has changed, it’s 81*! 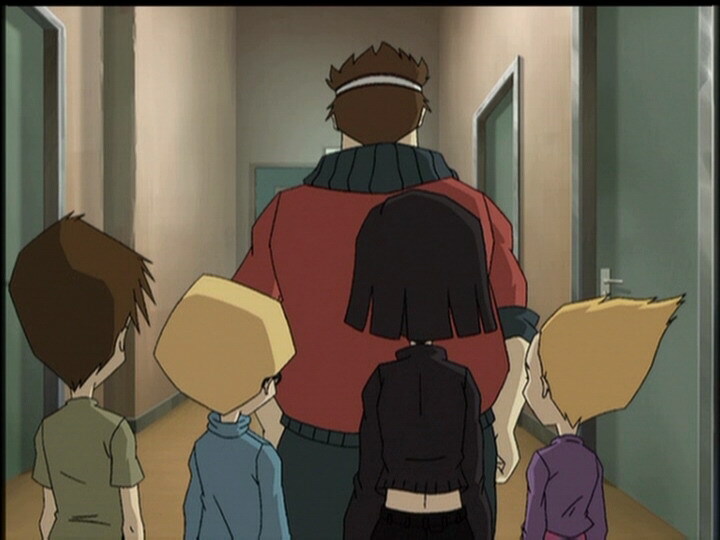 - We see the psychologist Hans Klotz teaching Yumi’s class, so he’s obviously a teacher as well. Jeremy: Yumi? Yumi, it’s me! Ok, I just launched plan Alpha! My five dry runs have all worked! Yumi: Uh, Mum and Dad? Can I talk to you for a second? It’s about my pen pal, uh…um, you haven’t changed your mind about her living here for a while? Mr Ishiyama: No, but tell us a little bit about her, Yumi. Well, we don’t even know her name! Mr Ishiyama: Is she Japanese? Yumi: Well, uh, yes! She is! Ms Ishiyama: What do her parents do, dear? Yumi: Uh, they uh, they work with computers. 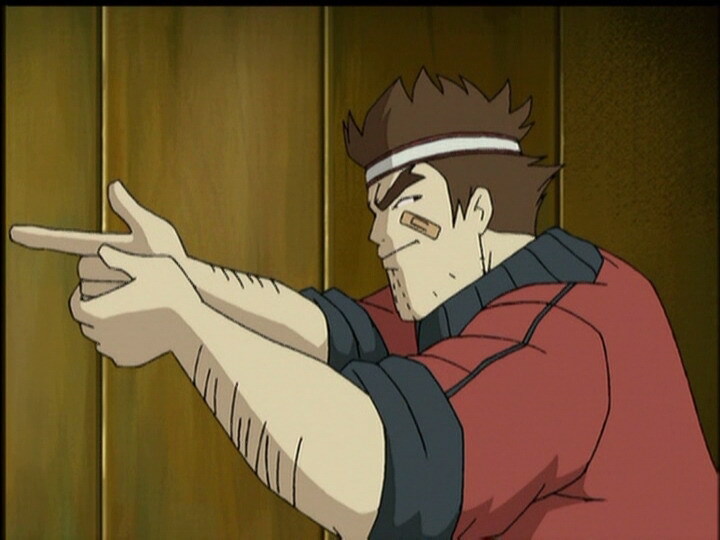 Mr Ishiyama: Well…alright then. She’s welcome to stay with us. Yumi: That’s fantastic! I adore you! You won’t regret it! She’s really so nice! Principal: Very well then, uh what is your cousin’s name, Odd? Principal: Hm, Aelita…and uh, where does she come from? Odd: She’s from uh, Holland! Principal: Hm…mhm! Well, her papers are in order and your parents have recommended her highly, so I see no reason why she can’t attend school here! Let me know when she arrives! Jim: Ok, what are you two up to, huh? Jim: What do you think I am, huh, an idiot? Jim: Quiet! 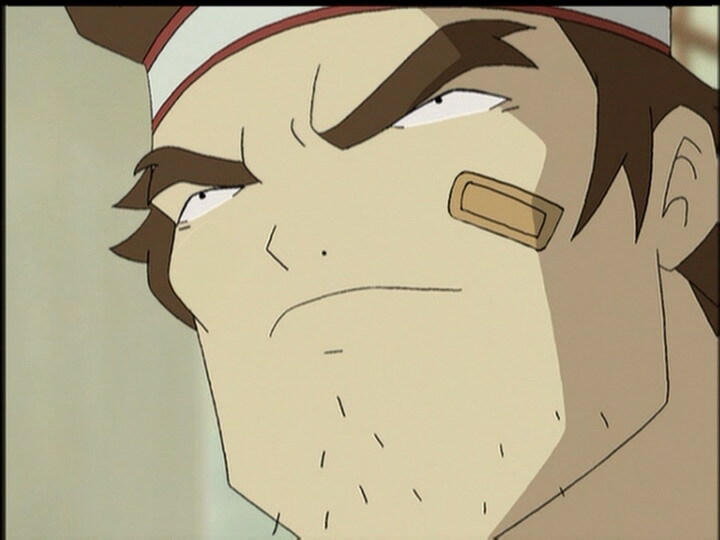 Yeah, and I’ll bet you think I’m not onto your pranks with Jeremy and Yumi! You disappear in the park like some sort of magic, you plot in your rooms! Odd: Hey, it’s not a crime! Jim: Maybe not…now you listen up! One of these days I’m gonna find out what the four of you are hiding! And now, to the cafeteria! Hurry up! Ulrich: Odd, that was a pretty good letter you faked from your parents! Odd: I can’t say I’m proud of what I did, but it was for a good cause. Jeremy: I can hardly believe it! Jim: Hey, Sissi! Have you seen Ulrich and his gang this morning? Jim: Where, in the cafeteria? Sissi: No, I saw them going to their rooms, Jim. Sissi: It is pretty strange to go to their rooms at this hour! I said to myself, now why would they be in their rooms now with someone who isn’t even a boarder? Jim: You mean Yumi Ishiyama is with them? Nicolas (to Sissi): You’re meaner than I thought! Jeremy: Aelita, I don’t know how to tell you this, but believe it or not…we’re waiting for you here! Odd: Because it’s time to take the big jump! And then it’s bye-bye XANA! Jeremy: We’ll be five for dinner tonight! Jim: What’s wrong? Up to no good again, aren’t you? Odd: No, we were just studying together! Jim (to the principal): Ah, I’m glad you’re here, sir! I don’t know what’s going on, but these little devils are up to no good and I intend to find out what it is! Principal: Yes, Jim, another one of your absurd stories about secret plots and passages? Jim: What do you mean ‘absurd’? Principal: Your paranoid behaviour and your one-track mind concerning these children are getting on my nerves! You’re a physical education teacher not a detective, Jim! Ms Hertz: Obviously, this phenomenon depends on certain factors. Who can tell us which ones? Jeremy? Go ahead, we’re listening. Odd’s clip: Break! Break dance! Break! Break! Break dance! Break! Break! Break dance! Here we goooo-oooo-oo! Break! Break! Break dance! Break! Break! Break dance! Break! Break! Break dance! Here we goooo-ooo! Jeremy: Oh no…what have I done?! Jeremy: I inserted the wrong CD! I have Odd’s dumb videos instead of the program… STOP! Ulrich: You made a video? Odd: Well yeah, it’s pretty good too! Yumi: Ok, that’s enough fooling around. We’ve got some cleaning up to do! Odd and Ulrich: SIR, yes, sir! Jim: Oh, you miserable little brat! Get back here! Ooh, wait ‘til I get my hands on you! Jeremy, stop! That’s an order! Yolanda: You’ll have to wait a week before putting that foot on the ground! Yolanda: And if you complain, I won’t give you crutches to get around with! Jeremy: Can I go to the bathroom? Yolanda: Sorry, the doctor insists you stay off your feet. I’ll go and get you a basin. Jeremy: Stop! In front of you! Jim: Haha, yeah! I was right! I was right! Eh? I was right, I was right! Jim: And she’s on this place called uh, Loko? 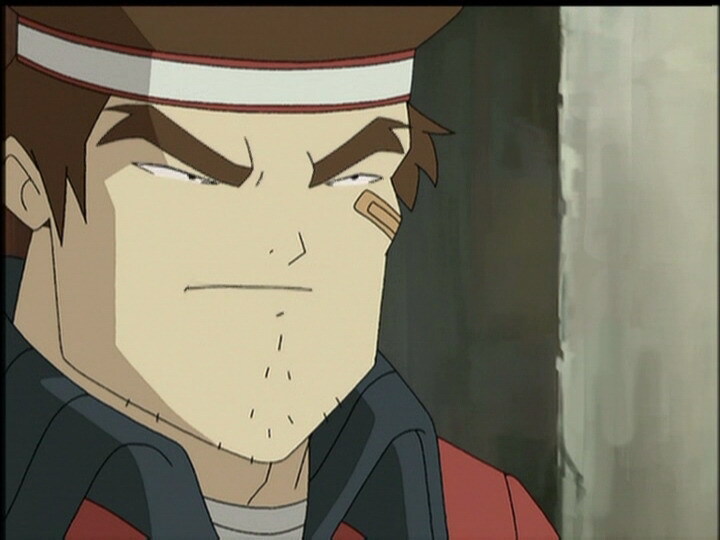 Ulrich (to a Megatank): Hey, you piece of junk! Nobody messes with my friends! Triangulate! Jim: Go on Ulrich, get ‘im! Show this XANA thing who’s the boss! Jeremy: Yeah, Jim! Don’t worry, he’s one of the gang now! Jeremy: Ok, well, ready to take the big jump? Jeremy: Then here we go… “Code Earth”! She’s here at last! 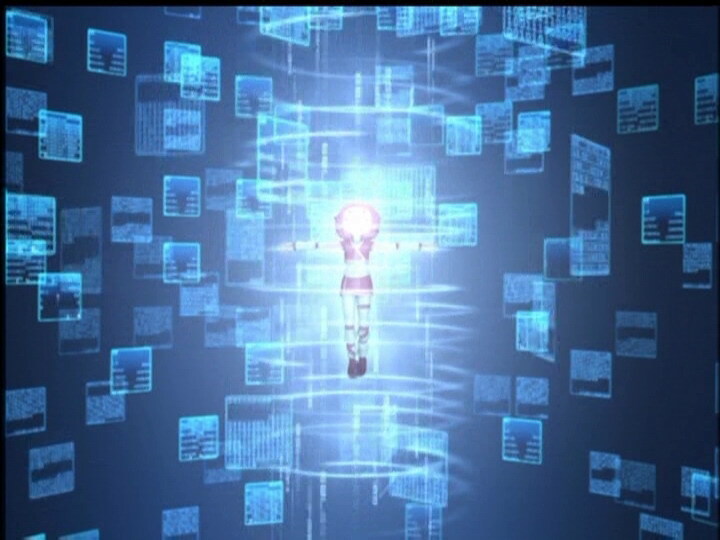 (to Aelita) Welcome to Earth!